Roast moong dal in a pan for 5 to 10 minutes. Cook rice, moong dal, milk and 3 cups of water till the rice gets cooked. 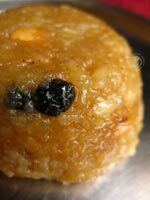 Melt jaggery, by boiling it with little water, and mix this with the cooked rice. Put ghee and keep stirring until everything blends well. Fry cashews, raisins in little ghee and add this to the above. Pound elaichis, and add this.